It’s getting down to the wire for the multiple Emmy Award-winning show RuPaul’s Drag Race, which airs Thursdays at 7 pm (CT) on VH-1. The hit series is now in its milestone 10th season, which originally featured a cast of 14 multi-talented drag queens competing for the coveted title of ‘America’s Next Drag Superstar,’ and a cash prize of $100,000. Superstar show creator RuPaul and celebrity judges will be judging the contestants on uniqueness, beauty, charisma and talent. The show is now down to the six competitors: Aquaria, Asia O’Hara, Eureka, Kameron Michaels, Miz Cracker and Monet X Change. Contestant Kameron Michaels (Dane Young), is one of the lucky contestants who is still vying for the coveted title. Like contestant Eureka, Kameron is also from the Nashville area, growing up in nearby Columbia, TN. Sure, Kameron is a master at slinging on those eyelashes and wigs, but fans are equally as likely to find this tattooed muscle queen down at the gym pumping iron, as you are to find him performing at her local drag bar or club. Deliberately intending to capture strength and beauty, Kameron Michaels proudly proclaims that he’s the ‘bodybuilder Barbie doll’ and it clearly shows! Between lashes, muscle curls, hair curls and barbells, Kameron took out a little time to answer 5 Questions for the Tribune about his amazing life as a contestant on RuPaul’s Drag Race. TRIBUNE: I recently talked to one of your fellow contestants, Eureka, who’s also from the Nashville area. Did the two of you know each other before getting on the show? KAMERON: No. I had never met Eureka before we went on the show. Before I became a contestant, I was telling some friends how much I love her energy. Eureka’s been here on the show before, so I wanted to latch onto her because she’s going to be a good friend for me on the show. She’s a very great support system, and that made me feel a whole lot better about the competition. So yes, I would say Eureka became a friend, but no, I did not know her before the show. TRIBUNE: You grew up in nearby Columbia, TN. Your background is in hairdressing. I understand that you also do fantasy and creature makeup, so for you which one came first? 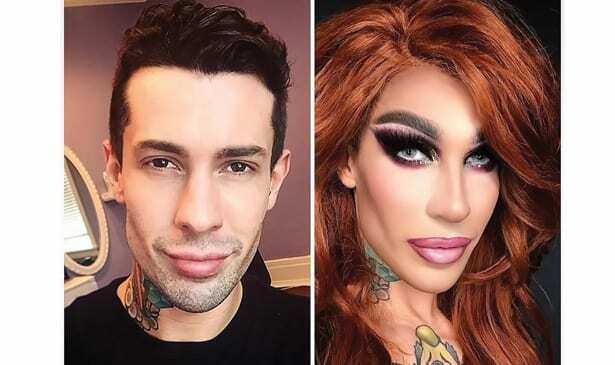 KAMERON: I dabbled in makeup and hair for a while when I was younger. And then I started working somewhere doing makeup, hair, and photography. I was working on these things until one day I just said, ‘Okay, I’m twenty-three years old, I have to figure out what I was doing with my life. I kept asking, ‘What gives me the most benefit and is also great for me to make money and also be happy?’ So, I chose to become a hairstylist. I went to school, and I decided that hairstyling would be the most lucrative for me. Once I became a full-time hairdresser, drag became kind of a hobby for me…I actually started doing drag when I was high school. I would sometimes do it on the weekends. I would do it for a couple years and quit. It was never a full-time job for me. When I auditioned for the RuPaul show I was still a hairdresser. TRIBUNE: Will fans recognize you without your drag makeup and outfits if they saw you out in public in your regular clothes? KAMERON: I actually got recognized at the mall this week. People are going to recognize me from the show just because you know half on half the show we are boys or men. But if viewers wouldn’t have seen me on the show as a boy, I don’t think they would know that it’s me. I really do take pride in myself on my transformation from dressing from male to female. I like to keep it a very fine line between the two and keep them (the characters) very far apart. TRIBUNE: If you win Season 10 of RuPaul’s Drag Race, what’s one of the first things you are you going to do? KAMERON: Take a vacation, because I’m probably going to need that. (LoL). One of my goals in life was to travel the world and now I have that opportunity. There’s also a couple of charities that I want to help out too. The Refugee Center is a big part of my mom’s life. She doesn’t work, but she’s volunteered a lot of her time there…I know that’s very important to both of us. But to take a vacation somewhere tropical and you know, escape the world for a while is what I’d really love to do…But even if I don’t win it all and just make it as a top four or top three finalists, I’ll be completely happy with that. I know how hard all the girls have worked, and all the people that couldn’t even get on the show, so just making it to that point would be incredible.